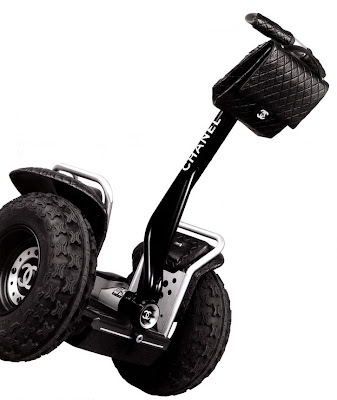 CHANEL announced the creation of the above urban personal transporter, which seems to have more fun than a bike and it looks as crazy as rollerblades. The rich-rider drives it by leaning in the direction he or she wants to go at speeds of nearly 20kph. With a range of 20km and an adaptation of the famous CHANEL 2.55 ,shopping couldn't be more glamorous. I already ordered a 24K Gold one, where's yours? Karl Langerfeld, you're a genius.